Information on brackish groundwater, which is important to Kuwait’s water supply, is being more effectively managed through an enterprise GIS. 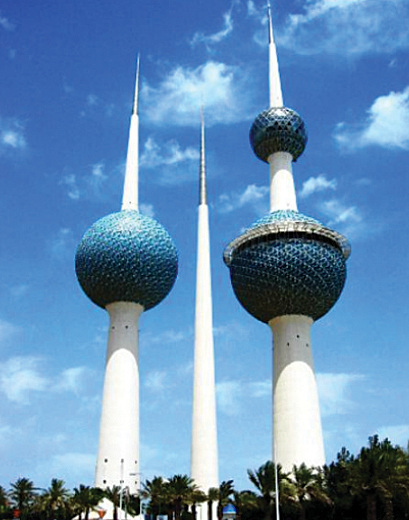 The regional hydraulic system underlying Kuwait consists of two aquifers. The upper one, the Kuwait Group, is composed of a layer of sediments and elastic rock saturated with water. It has a total dissolved salts (TDS) value between 4,000–9,000 particles per million (ppm). The lower aquifer, the Dammam formation, contains layers of consolidated limestone and has a TDS value between 3,000–6,000 ppm. Groundwater in Kuwait moves continuously with the slope direction. Brackish, saline, and fresh groundwater are found in these acquifers. Drilling and groundwater field construction, which was started by the Gas and Water division in 1950, was shifted to the Groundwater Administration in 1970. Hundreds of groundwater projects have been constructed through the cooperative efforts of the Department of Groundwater Projects and Water Networks Projects department. These projects resulted from the recommendations of groundwater studies and research departments. The water produced by these fields is used in blending processes for freshwater production, irrigation, and other consumption. Brackish water in the Kuwait Group and Dammam aquifers stretches from the east of the Arabian Peninsula and slightly sloping toward the Arabian Gulf. Brackish water wells are mainly located in the Sulaibiya, Shigaya, and Umm Gudair fields. In addition, the Al-wafra and Al-Abdaly fields are utilized by Kuwait Oil Company (KOC). Kuwait has 13 groundwater fields that support a total of 1,180 wells. These wells are dedicated to specific tasks such as drainage, exploration, monitoring, observation, and production. Several projects to make use of brackish water were established cooperatively by Water Projects Administration and Groundwater Administration. The water would be distributed to consumers through a separate pipe parallel to the freshwater distribution pipe. 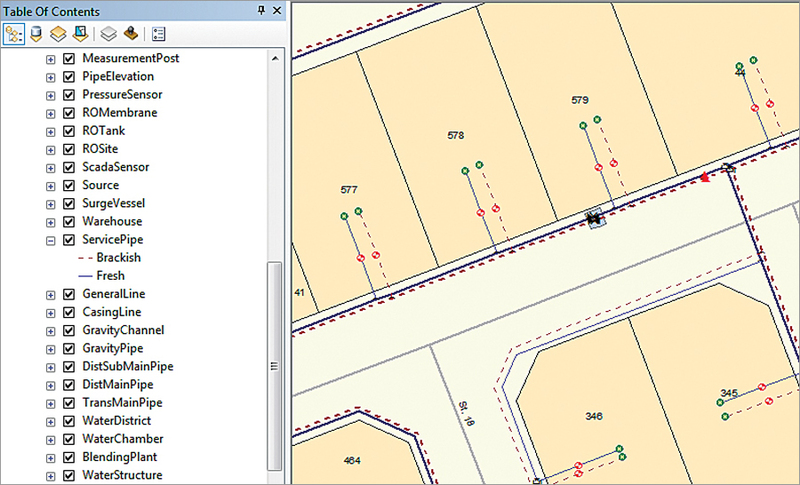 ArcGIS 10.2.1 for Desktop from Esri and ArcFM Desktop 10.2.1 from Schneider Electric were used to generate, update, analyze, and archive all spatial and tabular data related to this groundwater. The present total output of the installed capacity is about 126 Million Imperial Gallons per Day (MIGPD), and the maximum consumption in summer hits 87 MIGPD. Cylindrical groundwater tanks are used for storage. Their contents can be pumped directly into the distribution network or to elevated water tanks via transmission pipes after the water has been blended with distilled water. These tanks handle the hourly variation in demand for water and maintain constant pressure in distribution mains. Brackish water is available to 79,000 consumers. Other related programs have been proposed to step up production capacity through new fields in different areas. 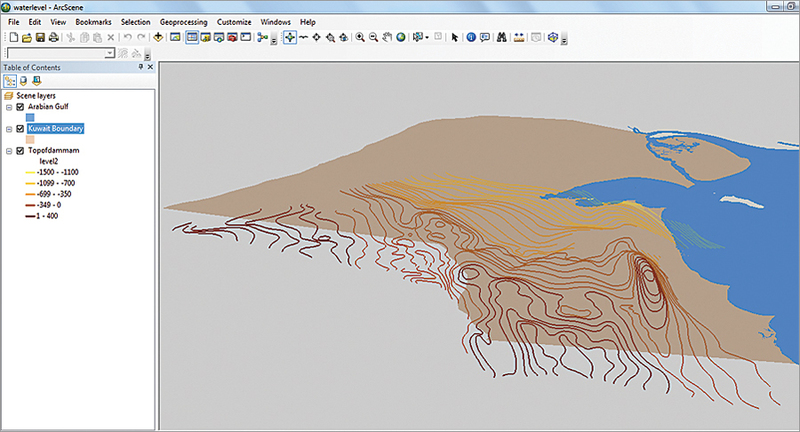 Recently, the Groundwater Administration started using GIS in all aspects of its operations. The ArcScan for ArcGIS extension was used to digitize scanned hard copies of sketches and maps. A survey of the location and condition of all related assets—water wells, transmission pipes, distribution pipes, pumps, and all fittings joining all these assets—was needed. The process of collecting this data was handled using Trimble PDAs connected to a base station to enhance accuracy. Postprocessing was used to get more accurate readings using Trimble’s Pathfinder software. A special data dictionary, created for the PDAs, was used for capturing asset attributes while acquiring the assets’ coordinates. This data was verified using up-to-date satellite images with a resolution of 0.6 centimeters. After comparison, 5 percent of the captured data was surveyed again by Water Administration engineers for verification and data approval before loading asset data into the enterprise geodatabase accessed in part or in whole by end users, editors, and surveyors, depending on the level of privileges assigned. Groundwater Administration engineers who were superusers worked to fully utilize the capability of the software. This project was accomplished through the cooperative efforts of the client, the Ministry of Electricity and Water; OpenWare, the Esri distributor and project contractor; and the subcontractor Khatib & Alami. An overall workflow was established to handle all issues associated with data capture, archiving, and validation and the approval process with each party maintaining its rules and subworkflow. For more information, contact Eyad Ghatasheh, OpenWare senior software engineer for the MEW GIS project, at 00965-60402910.